Uwell prides themselves ourselves in going the extra mile to ensure customer satisfaction when it comes to their products and customer service. Uwell was founded on the belief of providing only top quality subtasks using only use high quality materials. they don't take any shortcuts when it comes to materials, machining, and quality control because the safety of all vaping customers will always be the #1 priority. With dedicated research and development team, they always strive to bring new innovations and ideas into a reality in order to further advance the technology available in the vaping community. You can count on Uwell to be innovators, always in search of new ideas to revolutionize the way people vape. Uwell chooses not to follow in the steps of their competitors, but instead forge their own path to leave a mark in the vapor industry. You will not find a cheaper price on Uwell vaping products than at Ejuice Connect. Uwell introduces the stunning and elegant Crown 4 Checkmate 200W TC Starter Kit. The Crown 4 box mod features etched panels, leak-proof 510 connector, and a non-slip grip on the bottom. Maintaining the theme, the Crown 4 Box Mod features a crown design on the oversized firing button, and pairs perfectly with the Crown 4 Sub-Ohm Tank. The Crown 4 Sub-Ohm Tank is the next evolution to the well known Crown 3 with a new and improved parallel coil design and a new set of replacement coils. This combination ensures that users get the optimum experience by creating a duo perfectly suited for each other. The Uwell brand has become known for its ability to deliver high-performance products and its Crown series has skyrocketed the brand to a clear path of success. It’s now delivering the same hard-hitting performance with the combination of the Uwell Crown 4 200W Mod and the tried and true Uwell Crown 4 Tank. The Uwell Nunchaku Sub-Ohm Tank features a modern and eye-catching design that is sure to turn heads and a convenient Plug-Pull coil system for quick and easy coil replacement. The Nunchako features a separate condensation holder to limit leaking and conserve e-liquid. The new technology implemented by Uwell consists of a Professional Flavor Optimizing System that produces large clouds and great flavor at low wattages for saving power and maximizing e-liquid efficiency.The Nunchaku is made of 304-grade Stainless Steel and strong Quartz glass. 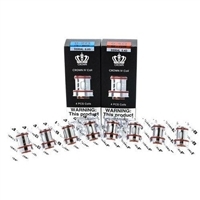 The Uwell Crown 4 Replacement Coils are highly innovative performance atomizer technology with ergonomic Plug-Pull mechanism, for the Uwell Crown 4 Tank. It is specially made with Parallel Coil Structure, allowing optimal airflow directly into the core. The integration of large wicking ports allows faster ramp-up speed as well as well-balanced flavor recreation. The much anticipated and highly regarded Uwell Crown 4 Tank has made its debut for 2018. 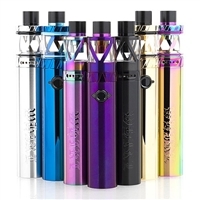 This is the upgraded version of the popular Crown 3 vape tank. The new Crown V4 has a wide 28mm diameter base featuring a 6ml e-liquid capacity, 90 degree threaded top fill method that unscrews to reveal dual fill ports. The Crown 4 utilizes the new and improved Crown 4 Plug and Pull replacement coil style, with a threadless design that features reinforced seals to provide a liquid tight fit and polished finish. Each coil features a vertical coil arrangement and triple vertical wicking slots for rapid wicking. The Crown 4 Replacement Coils consist of unique materials such as the SS904L and the FeCrAl (Iron, Chromium, Aluminum) Coils. The Crown 4 Coil Family utilizes organic cotton wicking material and comes with a 0.2 ohm Dual SS904L coil head rated at 70 to 80W, a 0.4 ohm Dual SS904L coil head rated at 60 to 70W, a 0.25 ohm SS304 UN1 coil head rated at 55 to 65W, and finally the 0.23 ohm FeCrAl UN2 coil head rated at 60 to 70W. All in which contains organic cotton. The adjustable bottom airflow makes for smooth and effective airflow, and can be fully closed to seal the system. Uwell has been an industry leader with their Crown series atomizer tanks and the Crown 4 is an excellent mid wattage flavor tank that offers a stunning aesthetic, Plug and Pull coil system and is sure to remain a favorite amongst experienced vapers. Introducing the Uwell IronFist 200W TC Starter Kit . The IronFist is a new device from Uwell and features an ergonomic design, comfortable textured grip. bright colorful chassis colors and Crown 3 Sub-Ohm Tank. The IronFist is powered by a dual 18650 batteries (sold separately) The Crown 3 utilizes the new Crown 3 Plug and Pull Replacement Coil Family, with a threadless design that features reinforced seals to provide a liquid tight fit and finish. Each coil features a vertical coil arrangement and triple vertical wicking slots for rapid wicking. Three 11mm by 2mm triple adjustable bottom airflow makes for smooth and effective airflow, and can be fully closed to seal the system effectively. Uwell's Iron Fist 200W TC Starter Kit is the perfect high powered vape mod starter kit for all users! Crown III V3 Tank Top Fill Tank by Uwell !RESTOCKED! *The drip tip colors will be random and any color can be obtained in the package.